As the fighting in Mosul rages on, the number of civilian casualties and displacements have grown significantly. While vowing to avoid civilian casualties by all means, the US is adamantly helping to maintain the siege until every single jihadist dies there. Air strikes targeting Islamic State (IS, formerly ISIS/ISIL) fighters in the Iraqi city of Mosul are frequently killing civilians, a number of residents who lost loved ones have been telling RT recently. While the Islamic State is known to use men, women, and children as human shields in Mosul, the city's residents have also accused the coalition of indiscriminate bombing. On Sunday, the Special Presidential Envoy for the Global Coalition to Counter Islamic State fighters, Brett McGurk bluntly warned that any remaining jihadists in Mosul will be killed inside the besieged city. Following McGurk's remarks which coincides with reports of growing civilian casualties, RT asked the US State Department if Washington is still committed to its earlier pledge to do everything possible to spare civilian lives across Iraq. “We try to have the best intelligence and information available that we can to avoid any civilian casualties. And again, we stand – I stand by those comments that we will sometimes, if we have information that indicates that there’s civilians nearby or civilians in a place, then we will refrain from acting,” Toner noted. Since October 2016, Mosul has been besieged by Iraqi troops, backed by Kurdish Peshmerga forces, Shiite militias, and the US-led coalition, trying to drive Islamic State out of the city. In January, the eastern half of Mosul was recaptured and operations to liberate the western side are ongoing. About one-third of Western Mosul has so far been liberated. 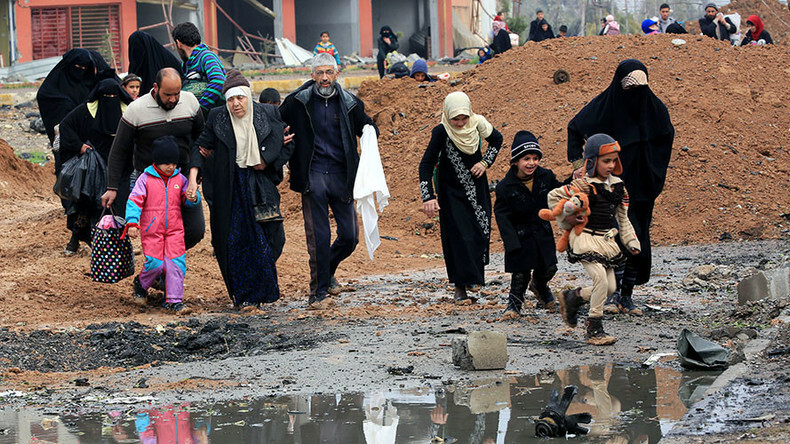 While the civilian death toll is impossible to calculate amid the ongoing battle for Iraq's second largest city, Sheikh Khamis Khanjar, the founder of the Office of the Sunni Arab Representative for Iraq, said at least 3,500 civilians have been killed in the battle for Mosul. Khanjar noted that most casualties are a result of US air strikes and "indiscriminate" shelling of crowded neighborhoods by the US-trained elite Counter Terrorism Service (CTS) forces, Reuters reported. According to Khanjar, some 850,000 people are still believed to be living in Mosul. The London-based Airwars monitoring group had earlier in the day assessed that the number of civilian casualties in Mosul far exceeded the numbers reported by the media during the operation to retake Aleppo by Syrian and Russian forces. “Since the assault, first on east Mosul and then west Mosul began, we have seen just a remarkable change at Mosul, moving from tens of civilians reported killed every week or even every month, to hundreds reported killed every week now by coalition airstrikes,” Airwars director Chris Woods told RT’s Ruptly video agency. In addition to the mounting civilian death toll, more than 200,000 refugees have fled Mosul since last October, according to the International Organization for Migration.